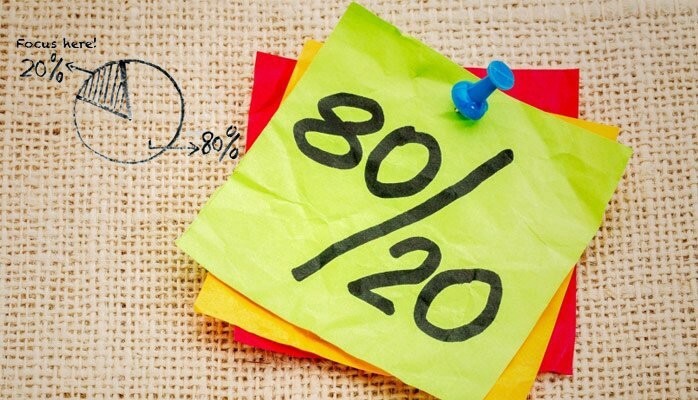 Now there’s a question and one with a seemingly obvious answer if you haven’t already heard of the Pareto Principle. If you haven’t though and you’re really serious about making the greatest possible impact in all areas of your life — The answer isn’t 80! I know that you will know that success is about doing a few things well and on a consistent basis, or as I put it in this piece on how to Grow & Super Charge A New Business, “Do Less Better” which strips things right back to basics, and many of my clients in my role as Business Mentor and Trusted Adviser tell me that it is this one piece of advice that enables them to really get it & hit the ground running! But if you don’t have the imperative of ensuring your business is a raving success, or the drive to reach for the stars in other areas of your life, how often do you actually put this truism into practice? And be honest! How disciplined are you each and every day? How ready are you to hold yourself to account and focus the rump of your attention and energy on just those things that really matter — That really count? Pareto was an Italian mathematician who in 1906 made the observation that 80% of the land in his native country was owned by just 20% of the population; he developed his thesis further and subsequently discovered similar correlations in the distribution of wealth and property in other countries around the world. So, my mother was probably onto something when she used to say to me in her inimitable way, “Change what you can, accept what you can’t — It’s a no-brainer Son”. And if you’re looking to ramp things up, identify and focus on that 20% in your everyday life, check out this wee piece too.